The FDNY and EMS response times have been completely compromised during the blizzard. Any normal type of response to Gerritsen Beach would be difficult if not impossible. The Vollies have taken up that slack going on multiple emergency medical calls. Thank you to all the residents who came out with shovels to clear a path to houses or helped us drag our equipment across the snow so we can tend to our patients. it is truly appreciated. For all of the residents that can’t stand those big, smelly, noisy diesel trucks ….. This was the first of many times I was out in my truck hooking up a tow strap to the Vollies and NYFD trucks that were stuck on main streets during calls during the storm. This was the least that I could do for our community knowing that every minute counts during medical emergancies. We all know that the snow removal was poor during this storm, but we all gave the helping hands and reminded us the we do belong to a great neighborhood! Gerritsen Beach Brooklyn (9:30am 12/28/2010)… Emergency vehicles getting stuck still! 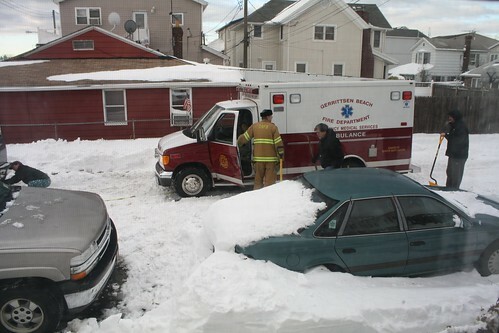 This is a pic of our local Fire Dept Ambulance having to get some help (from a truck and multiple neighbors hand shoveling) so they can get to a neighbor who is having a medical emergency. What’s not pictured is the TWO FDNY ambulances that are stuck trying to respond a 4 blocks away!!! Thank God we are a community of neighbors helping neighbors!!!! Many of our community members are FDNY, Police, and Sanitation workers. Most of them had serious trouble getting out to go help others yesterday AM and are still suffering today!!! My heart breaks for those poor people who had emergencies and had to wait for help due to the streets not being cleared!!! My Mother, who is a ICU Nurse, couldn’t get to her hospital to help keep the critically ill stay alive yesterday!!! So what I want to know is when exactly did Bloomberg lose his Human element? How did he ALLOW numbers come BEFORE neighbors?! Above is the blog I posted on Fox 5’s weather site. Wanted to share it w u! The pic is available for u to post, if you would like it. On hold 45 for 311…..city is a joke headed by an Idiot….. In all honesty, the Vollies were one of the major reasons I bought my house here. I grew up here with the Vollies always around & on call. When I first got married we couldn’t find an apt. here in the Beach, but after my son was born I wanted nothing more than to get back here!!!!!! The thought of having an Emergency without the Vollies scared the he** out of me!!!! So back we came. This was over 30 years ago & I have no regrets. Thats Right. Buy a few less Buds People.